SUBHEAD: Will puzzle artwork be the next crypto-currency trend to go mainstream? 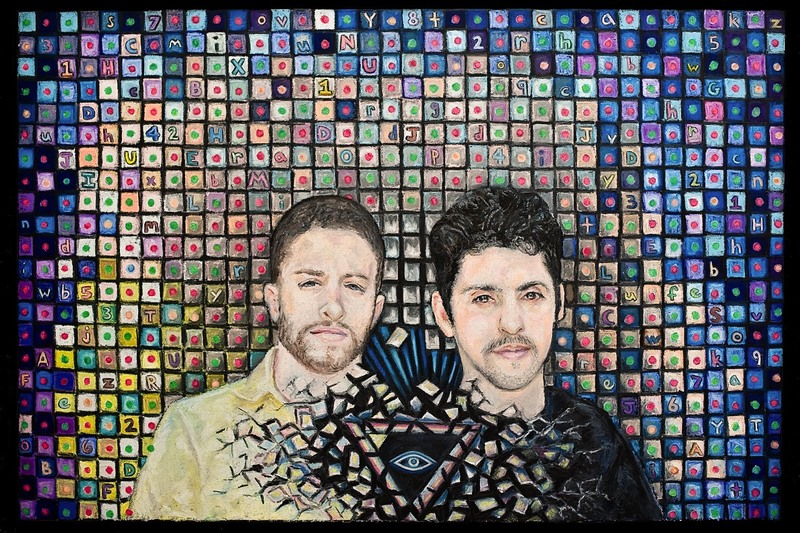 Image above: "Amir Taaki and Cody Wilson" portraits embedded in a crpto-puzzle painting solved in 2014 with a prize of 3.5 BTC (BitCoins). Click to enlarge. From original article and (https://bitcointalk.org/index.php?topic=661781.0). Note this "painting" is derived from a photo of the two founders of "Dark Wallet" - a system for hiding the identities of BitCoin owners. See (https://www.wired.com/2014/04/dark-wallet/). What's a crypto puzzle? Put simply, it's a burgeoning genre of artwork where viewers race against one another to solve a puzzle embedded in the picture. Whoever wins is rewarded with a purse of cryptocurrency. Marguerite deCourcelle lives at the peculiar intersection of Bitcoin and art. Under the pseudonym @coin_artist, she’s credited with inventing the crypto-art puzzle, a genre of images hiding complicated ciphers that reward the first solver with a walletful of virtual currency. he most famous of these is an @coin_artist oil pastel from 2015 called Torched H34R7S, the final work in a series known as The Legend of Satoshi Nakamoto. Depicting a ­turtledove, chess pieces, and a ­phoenix surrounded by flames, the painting incorporates symbolic references to Bitcoin’s creator, as well as to Shakespeare and deCourcelle’s personal life. An anonymous person solved the riddle in 2018, unlocking 5 Bitcoins, at the time worth about $50,000. This spring artist Andy Bauch showcased “New Money,” a collection of mosaics, at the Castelli Art Space in Los Angeles. The patterns in the pieces, which were made of thousands of Lego blocks and included a 4-by-9-foot horizontal triptych, contained clues to troves of Bitcoin and other ­cryptocurrencies. "How seemingly arbitrary art prices are, and seeing crypto prices fluctuating wildly, I was curious,” Bauch says. "Will the ­cryptocurrency I put in this art appreciate? Will the art itself appreciate regardless of the cryptocurrency?" Three of his works have sold - one of them for $14,000 - though the virtual coins hidden within one had already been taken before the show began. Per the unspoken rules of the ­crypto-art crowd, Bauch had posted photos of the works online, where anyone could view them and try to ­decipher their riddles. The pieces are also getting some high-­profile attention from the art world. The Whitney Museum of American Art in New York plans to show a 16-millimeter film by Jennifer and Kevin McCoy that offers clues to a Bitcoin address. The first solver will be named as one of the official donors of the piece, a distinction that can be resold or traded. At Bitcoin Art (r)evolution in Paris this fall, some 1,000 visitors in the course of a week viewed 40 works from @coin_artist and others, organizer Pascal Boyart says. He plans to embed crypto-art puzzles in his murals in the city’s streets. Image above: Detail of crypto artwork by Nanu Berk from an article about her thoughts on the new art industry. From (https://medium.com/blockchain-art-collective/crypto-art-is-no-easy-calling-heres-what-artist-nanu-berks-really-thinks-about-the-industry-7c5e84663614). DeCourcelle, who has an art degree from Eastern Oregon University, made the final piece of The Legend of Satoshi Nakamoto series when she found herself suddenly single and parenting two small children, living in a rented room at a friend’s house with no steady means of support. She spent four months working at night, during her boys’ naptimes, and between freelance projects to finish the painting, for which she’d already pledged 3.5 of her own Bitcoins in prize money. She survived in the meantime by selling the original Dark Wallet Puzzle painting for 10 Bitcoins, or about $3,000 at the time.